The extremely lightweight Liftkar PTR tracked stairclimber is impressively easy to use, has 3 speeds, acoustic and visual inclination warning as well as a range of up to storeys. The base unit with rechargeable battery fitted weighs approx. 28 kg; the handle unit approx. 11 kg. The Liftkar PTR ensures extremely safe handling on the stairs. 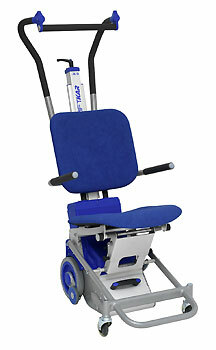 Click the button below to add the Liftkar Stairclimbing Transport Chair to your wish list.